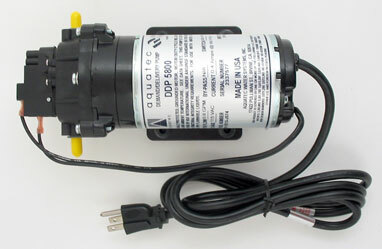 Demand or Delivery Pumps are pumps used to send water from a storage tank to a point of use. They should not be confused with “booster pumps,” which are used to increase the pressure going into the the reverse osmosis unit. Typical applications for demand pumps are to send water from a non-pressurized tank to a water vending machine or to increase water pressure from an undersink reverse osmosis unit to a refrigerator or icemaker that it is supplying. When there is a “demand” for water, the pump comes on and supplies it. When the demand is removed, the pump shuts itself off. When you push a button to fill a water bottle from a supermarket’s water vending machine, the button-push activates a solenoid that opens a closed valve in the water line. When the valve is open, the pump senses a demand for water and comes on. It pumps water through the open line until you release the button, closing the solenoid-controlled valve and shutting off the demand. Closing the valve causes pressure to build in the delivery line and the pump senses the pressure and stays off until there is another demand for water. In the pump pictured above, the water line is installed in the ports marked by the yellow fitting protectors. The pressure switch is the appendage at the extreme left in the picture. It simply shuts off the pump’s electrical supply when water pressure builds builds in the water line. 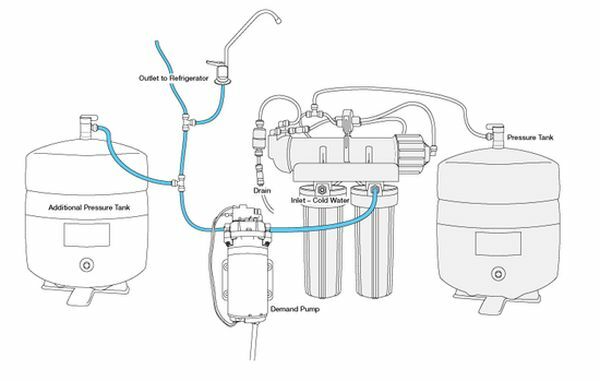 The illustration below shows a demand pump installation on an undersink reverse osmosis unit designed to send pressurized water to a remote refrigerator or icemaker. This is a good design, but there are other placement options. If the pump is installed in tube labelled “Outlet to Refrigerator,” the sink-top spigot will get water only from the tank at right and the pump will not turn on to serve the sink-top spigot. The pressure tank at right is the RO unit’s regular storage tank. The tank at left is an additional “pump tank” added to smooth out the pump’s operation and to provide extra storage. Water in the second tank is available for both the kitchen ledge faucet and the refrigerator. A check valve (one way valve) built into the pump head prevents migration of water back to the RO unit.